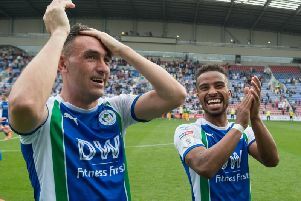 Wigan Athletic replace Reece James...with Reece James! Wigan Athletic have snapped up England youth international Reece James on a season-long loan from Premier League giants Chelsea. The 18-year-old will bolster the defensive ranks at the DW, ironically replacing his namesake - the former Manchester United full-back, obviously no relation, who was released this summer - at the DW Stadium. “Reece is a really exciting young player and we are delighted to get him here to Wigan Athletic for his first loan away from Chelsea,” enthused Latics boss Paul Cook. “In my time with the club, right back is an area we have been short at times and competition is really healthy for the squad. James already has international honours at youth level, helping England’s U19 side to win the Toulon Tournament and U19 European Championship in 2017. He also helped Chelsea to win the FA Youth Cup, the Under-18 Premier League and Under-18 Premier League Cup last term, which saw him voted Academy Player of the Year.